A 17-year old girl who realized she was pregnant while being held in an immigration detention center in has found herself at the center of an ongoing lawsuit over her right to get an abortion as an illegal immigrant. The girl is unnamed, known only as Jane Doe in all the documents associated with her. She was pregnant when she was originally caught, by herself, crossing the border in September. However, she did not realize she was pregnant until she was being held in a Texas shelter. We’ve talked before about the shelters the government is required to provide to unaccompanied minors held for potential deportation, and the governments failures when it comes to providing basic necessities in these shelters. However, the government was denying something else this time–access to an abortion. Jane Doe had made it clear that she did not want to carry her pregnancy to term, but was repeatedly denied requests to leave the shelter to go to a clinic and get an abortion. In the meantime, she was instead taken from the shelter to–without her request–to attend religious counseling sessions to convince her not to get an abortion and to a clinic to get ultrasounds to show her sonograms of the fetus. As the timer for an abortion was obviously ticking down, eventually the ACLU was forced to bring a lawsuit on behalf to enforce her rights to an abortion. This lawsuit is an interesting way to analyze a not well resolved issue of law: the rights of non-citizens to an abortion while in the U.S. However, it is worth first addressing the constitutional rights of non-citizens and illegal aliens in the U.S. Despite a bit of a misinformation campaign to the contrary, non-citizens inside the U.S. do have constitutional rights–end of story. But to explore both the lawsuit and the rights of non-citizens in general, we’re going to do a two-part article. This article will address non-citizen constitutional rights and the next one will deal with Jane Doe’s lawsuit itself. Right off the bat, illegal aliens have constitutional rights. Despite a great deal of information on the internet trumpeting that they do not, they do. Before you leave a comment on this article, they do. Seriously. Not only do they have constitutional rights, but the fact that they have these rights has been settled for over a century. The issue has been settled since 1886. The first cases addressing the issue all dealt with Chinese immigrants, primarily here as non-citizens working on the railroads. In three cases–in 1886, 1896, and 1903–it was firmly established that so long as you are within U.S. territory you have at least some constitutional rights regardless of your citizenship status or whether you are here legally or illegally. These non-citizens were ruled all the way back then to have 14th Amendment Equal Protection rights as well as the due process protections of the 5th and 6th Amendments. The lynchpin of these rulings rested on the words of the Constitution of the United States: “No state shall make or enforce any law which shall abridge the privileges or immunities of citizens of the United States; nor shall any state deprive any person of life, liberty or property, without due process of law; nor deny to any person within its jurisdiction the equal protection of the laws.” You notice that the first section of that quote says “citizen” while the rest of the sections simply say “person.” This is an important distinction; some rights are indeed generally reserved for citizens but due process and equal protection of law is guaranteed to any person in the United States. The Supreme Court has consistently stuck to this interpretation of the Constitution. In 2001, they ruled once again that the 14th Amendment applies to all aliens–legal or illegal. Two decades earlier, they ruled against Texas preventing illegal alien children from attending grade school on Constitutional Equal Protection grounds. To make a complicated issue short, states cannot deny to anybody in their jurisdiction–including illegal aliens–equal protection under their laws. The Supreme Court has, at least in the criminal context, also extended the protections of the First and Fourth Amendment. This includes rights such as search and seizure protections, a right against self incrimination, and political freedoms of speech and association. While illegal aliens do have Constitutional rights, the federal government has an extremely broad discretion in how to treat these non-citizens–immigration proceedings. The Supreme Court has long established that immigration law is the realm of the fed and these proceeding are essentially an administrative matter above judicial review. Immigration is treated as a national security and foreign policy matter–firmly in the realm of Congress. This means Congress can do things that might be constitutionally unacceptable if they were dealing with citizens; if only in the context of immigration and deportation proceedings. This power is further supported by the nature of immigration proceedings as administrative as opposed to criminal hearings–you don’t go to jail you just get deported. What Do the Constitutional Rights of Non-Citizens Mean in the Abortion Context? Non-citizens and illegal aliens have constitutional rights and, generally, enjoy protection of state law equal to that of a citizen. Depending on the state an illegal alien lives in, these rights are occasionally expanded by state law. While California likely offers the most additional protections, many states offer things such as in-state tuition, driver’s licenses, healthcare, and more. If somebody tells you non-citizens do not have constitutional rights or are not protected by the law, they are incorrect. But before Jane Doe’s case there had never been a case specifically ruling on the constitutional rights of non-citizens to an abortion. 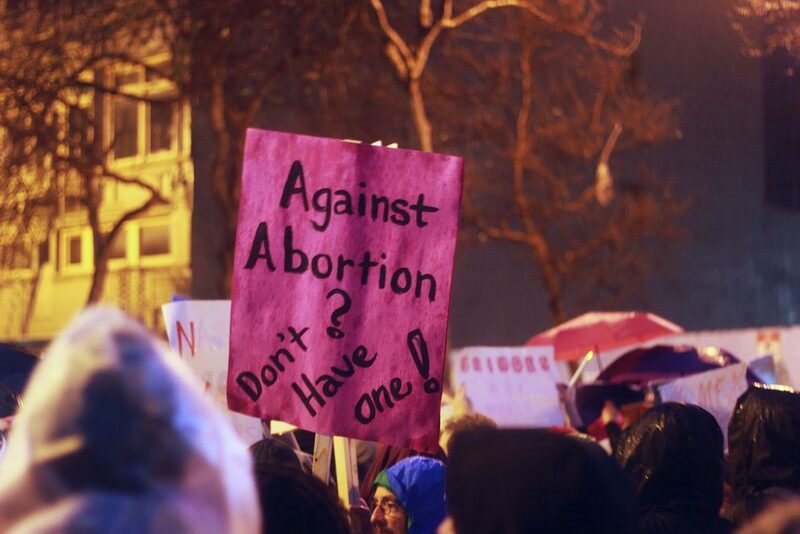 Obviously there are a great deal of protections for citizen women seeking an abortion, although some might argue these protections are not enough. However, no court had ruled on the specific issue. Non-citizens enjoy equal protection of the law, but how does that apply when it comes to the law on abortion? Later this week we’ll look at Jane Doe’s case and find out.